I'm having something very yummy with my breakfast tea today. I was way overdue on making the (requested) scones for the office, so I had time this morning before work and mixed up a batch of White Chocolate-Cranberry Scones. One thing I can't overemphasize is how very much I love both my scone pans! 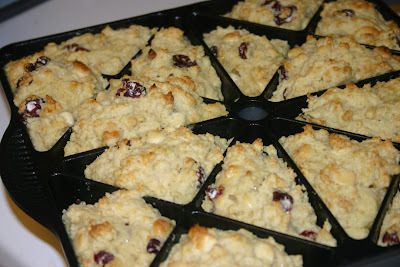 I've been using a regular, traditional size scone pan for years, and recently I added the mini-scone pan. Sometimes, a large scone is just too much, so the mini-sized ones are fast becoming a favorite. Both my scone pans came from Williams-Sonoma and are by Nordic Ware. They cook the scones evenly, clean up easily, and I am going to be a customer for life. That little pitch aside, I thought I'd share my scone recipe, too. Here you go! Preheat oven to 400 degrees and spray a scone pan with cooking spray. In a large mixing bowl, combine flour, baking powder and baking soda. Add 6 tablespoons of chilled margarine and combine using a pastry blender until the mixture consists of pea-sized crumbs. Stir in cranberries and white chocolate chips. In separate bowl, whisk buttermilk and egg. Add to dry ingredients and stir just until blended. If mixture is too stiff, you may want to add another tablespoon or so of milk. Spoon batter into pan and bake for 17 minutes or until lightly browned. Share with colleagues and enjoy! Last night's supper was Chicken Pasta Salad with Creamy Chamomile Dressing. 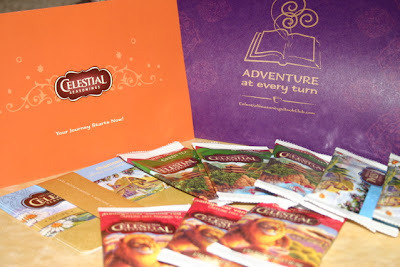 This was the recipe included with the "starter kit" I got for signing up for the Celestial Seasonings online book club. The dressing recipe calls for steeping three bags of their chamomile tea (also in the starter kit) in 1/4 cup of white vinegar, then mixing it with mayo and freshly-chopped tarragon. I used whole wheat pasta, and this ended up being a very light, tasty supper which my husband and I both enjoyed very much. Now, about that strange little book they chose for their first book club selection ... Yesterday the local bookstore called to say my copy of "The End of the Alphabet" by CS Richardson had come in. (It's spelled that way, by the way: CS, not C.S.) Fortunately, it's a short book, just 119 tiny little pages, but I have to say I didn't care for it. I didn't buy the character's name (Ambrose Zephyr? C'mon!). I didn't like the plot (English ad exec is suddenly diagnosed with unknown but definitely-definitely-definitely fatal disease, and he and his wife Zipper - ZIPPER! - are going to dash out to visit all these places, from A to Z, that Ambrose never visited). It's written rather stream-of-consciously, which I didn't care for. There was a bit of language of the sort I don't enjoy hearing or reading, and I never really cared for Ambrose or Zipper. Yes, there were a few mentions of tea in the book, but it's not at all the pleasant, thoughtful read I was expecting. I got through and thought, "What were they thinking? That we'd all enjoy relaxing with a nice book about a dying man?" Methinks Celestial Seasonings needs to find a more upbeat book next time. And feel free to disagree, as this is merely my opinion. Anyone else read this book? If so, what say you? One of the wonderful things about blogging, say the experts, is that a blog is a dialogue and not a monologue. I wholeheartedly agree. As a blog writer, I have to say I greatly enjoy the feedback I get from readers. You've shared recipes and cooking tips, bits of history, recommendations for tea, and all kinds of things that make this blog far more lively than it would ever, ever be if yours truly were the only one "talking" all the time. 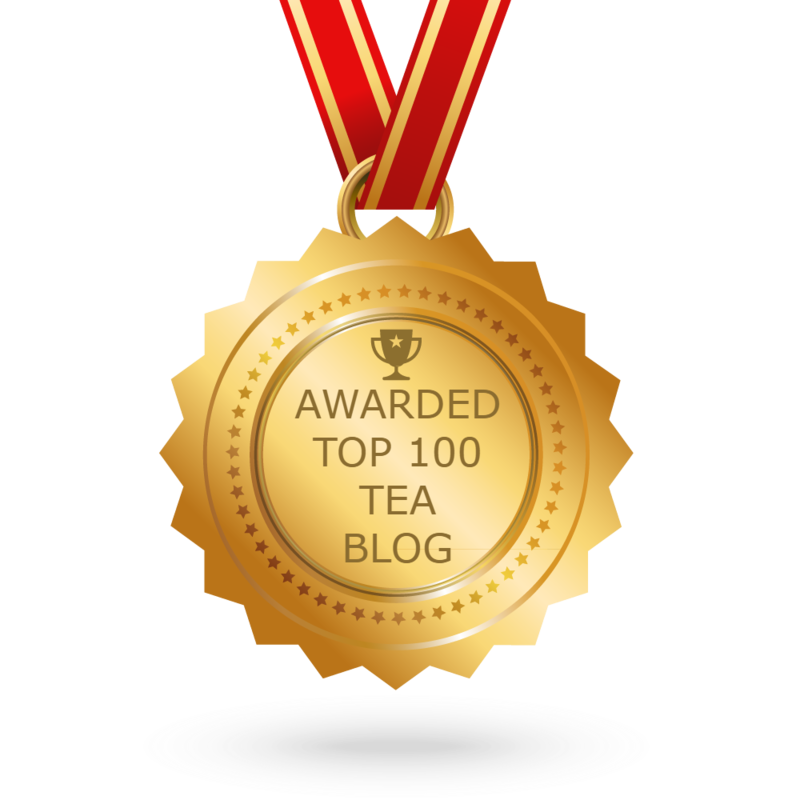 That said, I have to tell you how grateful I am that a reader and friend of this blog, Tea Lover Denise, e-mailed last week with the most wonderful thing she'd found and wanted to share with me. 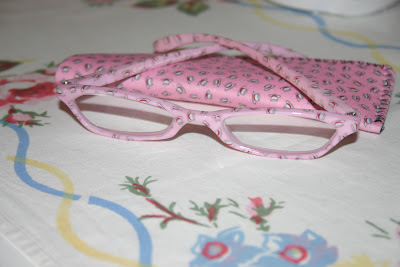 She was searching for "tea glasses" on eBay and came across these adorable pink reading glasses. They're a Mary Engelbreit design and feature tiny little teacups on the glasses and case. The seller, who has a store called Crafty Lady, was exceptional, sending out my 2.0 strength glasses (just $9.25 plus some very inexpensive shipping) immediately. I simply love them! 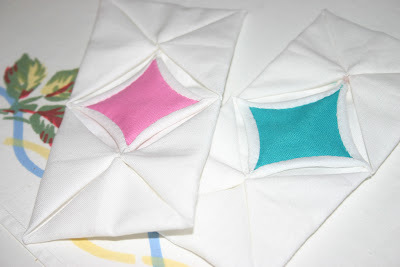 I wear contacts during the day, but now my 43-year-old eyeballs require reading glasses for doing needlework in the evening, like these two Cathedral Window blocks I made last night. I will NOT age before my time, so I'm big into the cutesy reading glasses. I have some plain pink ones, some "smart girl" teal ones, some black Brighton ones, some burgundy floral ones ... and now, some pink teacup reading glasses. Thank you, Denise! Another weekend, another tea! 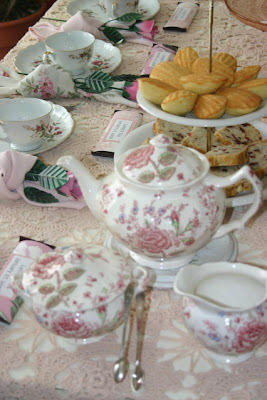 This time, it was a tea held simply in honor of my 12-year-old friend Lyndsi. I met Lyndsi years ago through her aunt, who is one of my best friends, and one day I mentioned we should have a tea for her "one day." For years (I'm ashamed to tell you how many) I have said yes, we'll have that tea "one day" but never scheduled it. When my friend recently mentioned that Lyndsi was still hoping we'd have that tea "one day," I realized it was time to pull out some pink stuff and have a tea for no other reason than simply to honor Lyndsi. 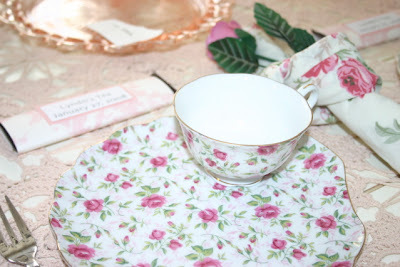 I looked for a new pink tablecloth, but you know what I ended up using? This old pink crocheted bedspread I found in the linen closet. Why not? The Johnson Brothers Rose Chintz looked nice against it, I thought. 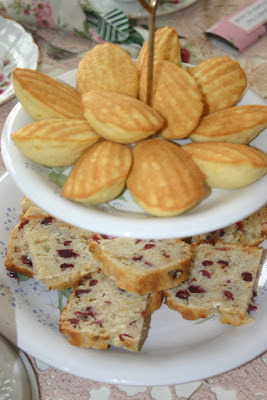 Of course we had to have madeleines (orange flavor) and White Chocolate/Cranberry/Walnut Tea Bread (left over and frozen from last week's tea, it kept beautifully). 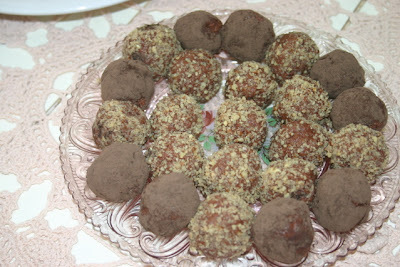 Into every tea a little chocolate must fall, so we had Chocolate Truffles rolled in pecans and dark chocolate cocoa. 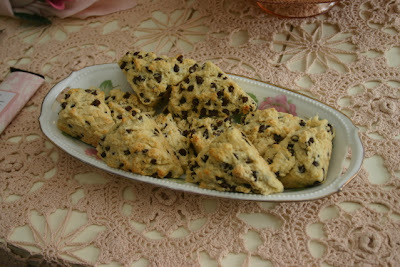 And Mini-Chocolate Chip Scones with cream rounded out the menu. And the tea party favors this time? 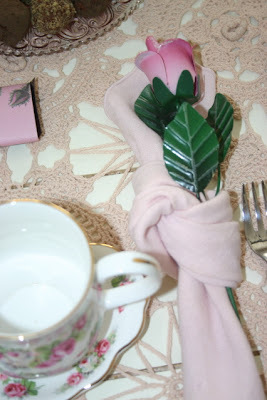 Pink tin roses were placed in napkins folded into a knot shape. 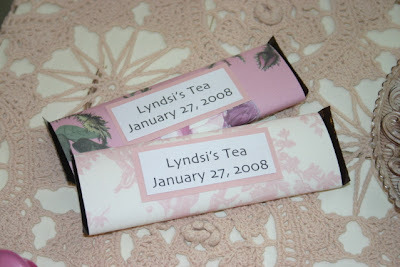 And finally, the child who waited so patiently for her tea party deserved personalized candy bars, embellished with pretty scrapbooking papers. 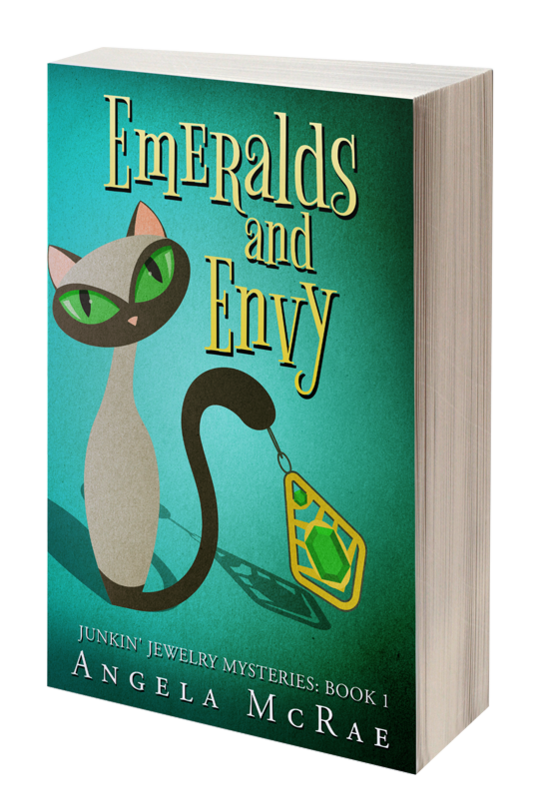 Did any of you join the new online book club announced by Celestial Seasonings last month? I did, and I was pleasantly surprised when this lovely purple box of goodies arrived over the weekend. I haven't gotten the first book club selection yet, but it's on order. You have to buy the book yourself, but the welcome package is free. If you want to sign up for the book club just go here. I was quite surprised at how much they packed into this little goodie. First, there are 20 free tea bags! I don't know if they'll all be the same, but I got eight samples of Chamomile herbal tea, six of Madagascar Vanilla Red rooibos tea, and six of Raspberry Gardens green tea. There are also little cards that have a bookmark and recipe. 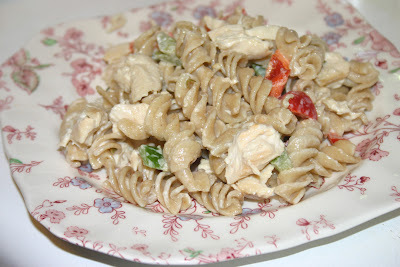 They're all the same recipe, but it's an intriguing one: Chicken and Pasta Salad with Creamy Chamomile Dressing. For the dressing, you have to steep the chamomile tea bags in white vinegar for 15 minutes. Doesn't that sound interesting? I'll let you know how it turns out! What is latched away in this box? 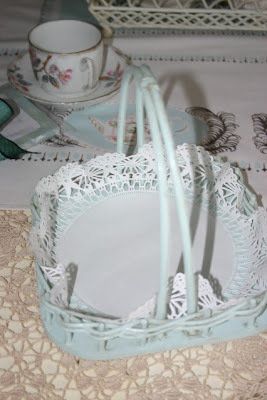 A brief history lesson inspired by a terrific antique store find! 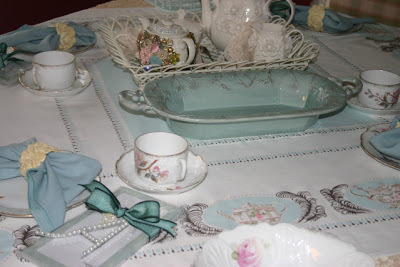 Now I'm having another tea this weekend and thus have been spending lunch hours trolling places I might find party favors and thrifty decor. Yesterday, I was in a local antique store and saw a display of vintage tins and boxes. I almost never look on top of cabinets and shelves, but yesterday I did and boy am I glad! 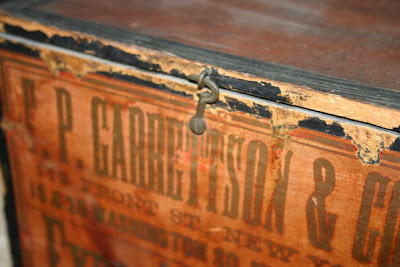 This antique tea chest was just peering down begging to come home with me, I know it, and since the picture is rather small here's the wording: "F.P. 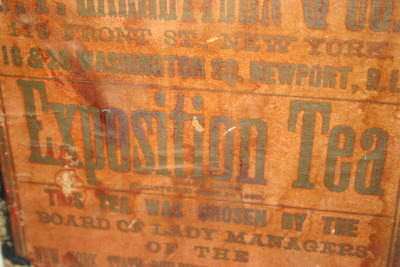 Garrettson & Co., 119 Front St., N.Y., 16 & 20 Washington Sq., R.I., Exposition Tea, Trade Mark Registered June 20 1899, This Tea Was Chosen By the Board of Lady Managers of the New York State Building at the World's Fair." But I'm not sure exactly WHICH World's Fair this refers to. The date of the trademark is 1899, which I suppose could (but doesn't necessarily) mean the chest could have been in circulation at the time of the 1900 World's Fair in Paris. 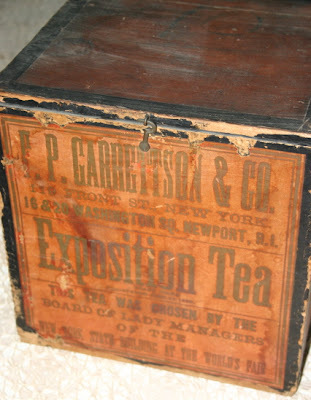 In 1904, the St. Louis Exposition was held in Missouri, which of course would place the tea chest much closer to us here in Newnan, Ga. I have already e-mailed a World's Fair expert I found on the Internet asking for help. (Mr. Terry, are you there?) 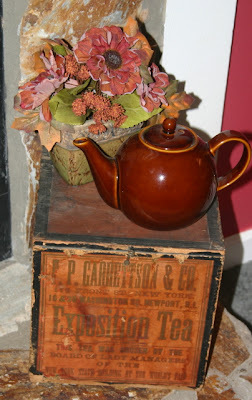 At any rate, I am just delighted at this bit of memorabilia and couldn't wait to share it with my fellow tea lovers. If any of you World's Fair collectors can add to what I've shared, please comment! I'd love to know more! Although they shouldn't, my friends often seem to bring me gifts when I have them over for tea. 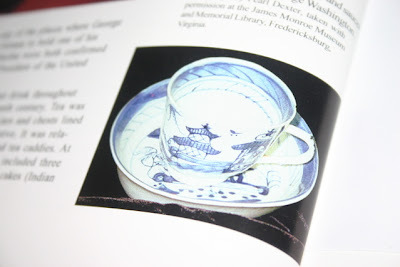 One of the gifts I received after the tea held over the weekend was this Duchess bone china teacup from England. 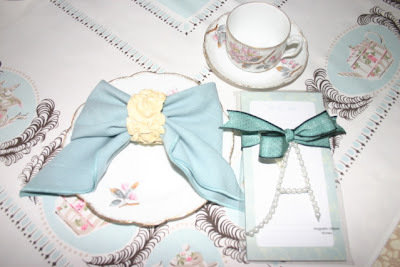 Duchess is a name I've seen frequently in the teacup world, and I particularly love the design of this one. The background color is what I'd called "winter white," not stark white or beige, and the roses are soft and subtle. 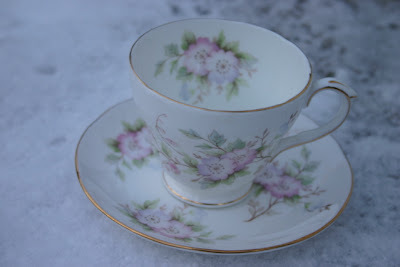 What a great teacup by which to remember my "Tea in the Snow." I've been using this teacup ever since I received it, and there's something else I really like about it too: the handle is nice and wide, and my finger hooks through it quite comfortably. If you're a longtime teacup user, I'll bet you know what I'm talking about when I say some teacups are awkward to hold because you have to either "pinch" the handle between your thumb and first two fingers or else risk breaking off the handle when you force your fingers through. Some etiquette experts recommend the "pinch" method of holding a teacup anyway, but I'm all in favor of the "comfort" method, meaning whatever is comfortable to you. And with all the cold days we've had recently, I so appreciate having a comfy, pretty cup to use for all these cups of hot tea I'm sipping! 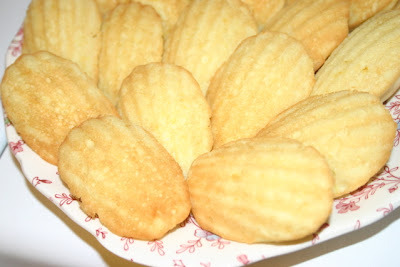 Some of you who've been reading this blog awhile are aware of my difficulties in learning to bake madeleines. These are those classic, centuries-old French cakes with the famous scallop shape and ribbed design, baked with lemon or orange zest and often enjoyed dunked in tea or coffee. Back in the fall I baked numerous experimental pans of the things, but they never popped out of the pan with the pretty shell shape as they should have. Tired of eating what amounted to Lemon Crumble Cake, I gave up for a while. 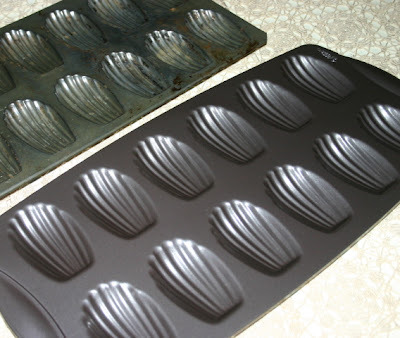 The madeleine pan I was using was one I found at the local antique mall. It was just a few dollars, it was vintage, it was French ... and it never worked for me. Not even when I generously buttered it three times, freezing the pan between butterings to get every nook and cranny of the pan covered well. Then one day, I found in a Ross store a Wilton, non-stick madeleine pan for just $4.99. Somehow, when I got up to the register the sticker had non-stuck to the pan. (And no, I didn't remove it, for bargains wouldn't be any fun if you got them by cheating!) I didn't realize this at first, so I was puzzled when the clerk scanned the 99¢ clearance box of tea I was buying a second time. She told me the pan's sticker was missing and asked if 99¢ was OK for the price. "Well, yes, that'd be great!" I said. My goodness! I didn't try baking madeleines again over the holidays because I didn't want to risk another baking failure. 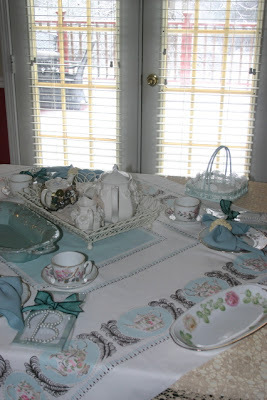 But Sunday morning, with church called off because of snow and a tea party coming up that afternoon, I tried again. Using a recipe I found in "The Perfect Afternoon Tea" book, a very simple recipe that called for confectioners' sugar rather than granulated sugar, I fired up the oven. I even (on the advice of my DH) sprayed the non-stick pan, just to be on the safe side. From the first lemony madeleine to the last, they poppped out of the pan just picture perfect, and these will now be a lovely addition to my repertoire of easy-to-make teatime treats. (I also have a New York Times madeleine recipe thoughtfully supplied by a reader of this blog, and if I can remember to actually print it out before my next baking session I want to try it using the new pan as well.) If you want to try baking madeleines for yourself, please do yourself a favor and begin with a new, non-stick pan! Now for those of you outside the South, you have to understand that we southerners have gotten to where we're a bit excited about mere raindrops these days. So to get some snow, and to get it twice in one week ... well, some of us are quite beside ourselves, to put it mildly. Some of us, also, were scheduled to have our first tea party of the year this weekend, and I am happy to report it went off quite splendidly. All three of the invitees made it over just fine on Sunday afternoon, and the tea met my two great requirements for a successful event: 1) There was lots of laughter all around and 2) all the food was edible, some of it even quite tasty. 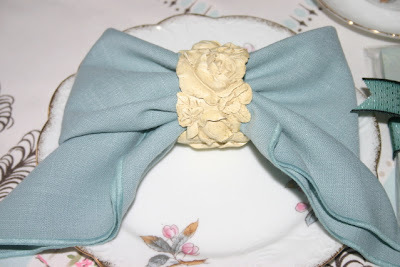 I was able to use a vintage blue basket I've had in my sewing room for a while, and also called up for service were these blue napkins (fashioned into bows courtesy of my napkin folding book) that were actually bought to match the striped upholstery on my deck furniture. The tea party favors were almost an afterthought, and -- NOTE: if you were at the tea, please don't read this next part -- quite inexpensive. Michaels has these pearl letters and icy blue notepads for $1 each, and tied together with blue ribbon, I thought the effect was nice. I'll have more to say about the menu another day, but let me just mention that I managed to completely MASTER a certain shell-shaped French cookie/cake long revered in tea party circles. Yesssss! That's what I'm talking about! 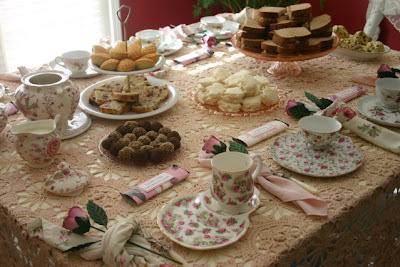 And the rest of the menu included: Raisin Mini Scones with Lemon Curd, Ham and Cheese Scones, Salmon Pinwheels, Cucumber Sandwiches, Chocolate Truffles, that certain shell-shaped French cookie/cake, and Cranberry/White Chocolate/Walnut Tea Bread. Our teas included a Czech Republic Pear blend, Chocolate Mint tea from Harney & Sons, and a Peach/Raspberry tea one of the guests found for us at Whole Foods. Not surprisingly, I was so excited by the time my guests arrived that I forgot to take photos of the food-laden table. Happily, I did go a little camera nutty the day before with all the snow. Cold as it's been this weekend, my lady friends said they'd looked forward all day to getting over here and enjoying all those nice hot cups of tea. It makes me smile just to remember it! One of my recent Christmas gifts is one I'll be enjoying, part of it at least, all year long. 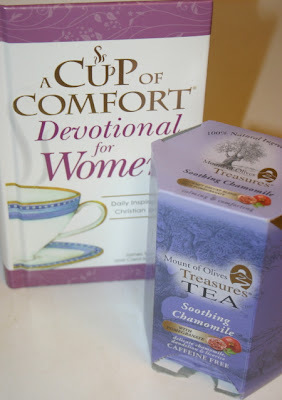 It's the book "A Cup of Comfort Devotional for Women," and it was accompanied by this box of Mount of Olives Treasures Soothing Chamomile Tea with Pomegranate. 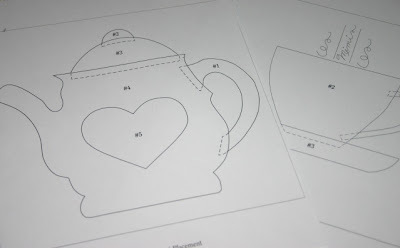 I love the theme of this gift, combining, as it did, comfort, simplicity and tea. The brief devotionals are easy to read during any spare moment during the day, and I tend to keep it near my dressing table so I'll be sure to read it daily. The tea is indeed soothing, a good, caffeine-free variety, and I'm now sold on the idea of giving others a "Cup of Comfort" book (there is one just for writers!) and chamomile tea. And in other news, would you believe we're supposed to get snow again tonight? 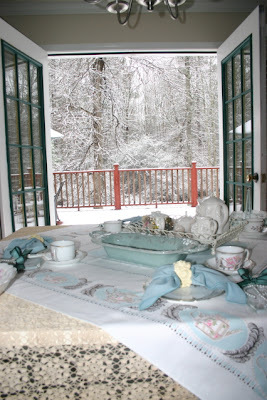 When I said "let it snow, let it snow, let it snow" the other day, I *meant* to add "except for when I'm planning my first tea party of the year" which is this weekend. But I've never had to cancel a tea because of snow, and I don't plan to start now! The good news is, we got snow yesterday! I was at the office when those huge, fluffy snowflakes began swirling through the air about 3 p.m. But did I have my camera with me? Nooooo. And the bad news is, it's stopped snowing, the roads are clear, so no Snow Day here. But it was sure fun while it lasted! It's still cold, though, so for a warm and cozy breakfast treat, I tried the Apple-Cinnamon Tea Oatmeal recipe from that "Ultimate Tea Diet" book I got recently. I don't know if you have any of that fine, almost powdery tea, but I do. A friend gave me a tin of tea that actually tastes fine, but I don't like the consistency, since it looks like coffee grounds. This recipe includes three pinches of dry tea, so I was happy to have an excuse to use this London Cuppa tea. 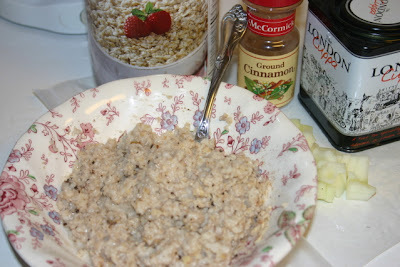 The recipe calls for a bowl of prepared oatmeal, the three pinches of tea, 1 tablespoon of almonds (I had walnuts already chopped), 1/4 cup chopped apple (I used Granny Smith) and cinnamon (just a sprinkle). The tart apples were a nice pairing with the oatmeal, nuts and cinnamon, so I'll be making this quick and easy dish again. And guess what? I bought the "Ultimate Tea Diet" last week, but yesterday at work I received a review copy of this very book in the mail. Want it? The first person to post a comment today can have it. After you post, just be sure to send me your snail mail address using the link at right. Here in Georgia we are gearing up for a "wintery mix" that may be coming overnight. Since we haven't seen snow or even ice in my neck of the woods in years, I am quite excited about the possibility of freezing temperatures. And speaking of temperatures, my new Mrs. Tea has caused me to reexamine some old teas at new temperatures. I wasn't that fond of the Candy Apple tea sample I had when I tried it before, but in the Mrs. Tea tea maker, it's good! A reader has pointed out that Mrs. Tea doesn't actually boil the water, but since I like a slightly cooler temperature of tea, that works great for me. Candy Apple tea is what I sipped last night while a) watching American Idol and b) searching for a quilt book I found on eBay some months ago. If I'm going to get frozen inside the house for a few days (fingers crossed), I am going to have some needlework ready. 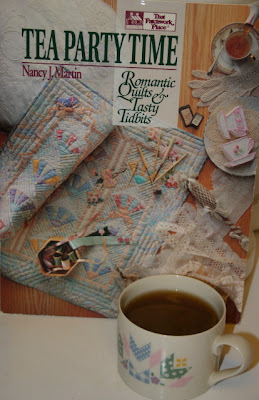 This book is called "Tea Party Time: Romantic Quilts & Tasty Tidbits" (That Patchwork Place, 1992), and it's by Nancy J. Martin and includes recipes for tea party foods in addition to the quilt patterns, which I think is a particularly clever idea. 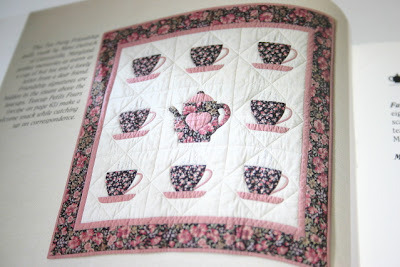 The quilt I most like in this book is titled Tea Party, consisting of a teapot center block surrounded by eight teacup blocks. I believe my applique skills are up to the challenge, and we shall see. Now ... let it snow, let it snow, let it snow! And a question for inquiring minds who want to know: See the cup up top, the one with the quilt design on it? It's stamped International Tableworks, but I don't know the name of the pattern. Do you? Any help would be much appreciated! I'd forgotten how much fun a hot glue gun could be! Somehow I never saw my glue gun again after I moved a little over a year ago, so after getting by with Elmer's and Super Glue for a while I decided it was time to invest in a new glue gun. 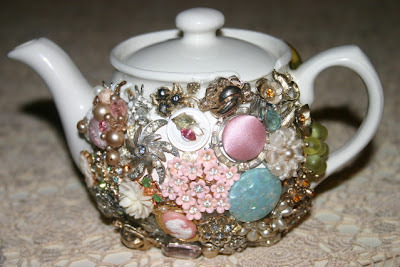 And to celebrate, last night I went to town on a project I'd been mulling over for quite some time: The Fantasy Teapot. 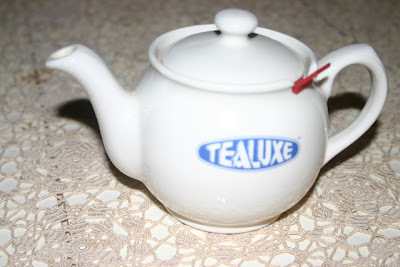 I had an old Chatsford teapot with the Tealuxe logo on it collecting dust out in the garage. First, I painted over the the blue logo with white paint so it wouldn't be seen through any of the jewelry findings I was about to attach. Then, I started sorting through the old tin of jewelry bits and bobs I'd been collecting. Assorted single earrings, some stray rhinestones and pearls, some fancy buttons. I can assure you, pulling a trigger has never been so much fun. I come from a long line of bargain-hunters, and our family stories are likely to swirl around, for instance, those sterling silver candlesticks grandmother found for $1 and sold for $100. We all love to scour thrift stores and yard sales, and we all have lots of stories about the great buys nabbed over the years. 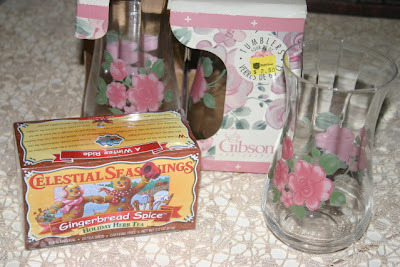 This weekend, I visited my mom and she sent me away with a new set of glass tumblers with a rose design (thrift store, $2.50) and a box of Gingerbread Spice Tea from Celestial Seasonings (CVS, 28 cents). She said Christmas items were 90 percent off last week, so I will be paying a visit to the store later today. Perhaps you've heard about the CVS store and its Extra Bucks program? My sister is one of those savvy shoppers who works the system and ends up going into CVS and leaving with $50 worth of items that cost her something like 67 cents. Last time we talked, she had used extra coupons for some batteries and it somehow resulted in CVS giving her the batteries AND money back, so essentially they paid her to take them. I love that! The CVS bargain Gingerbread Tea is going with me to the office today. The tumblers got me to thinking: Wouldn't those be pretty on a "garden party" tea table in the Spring? We actually have a chance of "frozen precip" in the forecast for this week, so naturally I am mentally hosting a garden party out on the deck. But whether it's warm or cool outside, it's always a good time for tea! "The Ultimate Tea Diet Book"
Diet books flood the bookstores each January, proving that I'm not the only one who might've eaten a bit too much coconut cake and Honeybaked Ham over Christmas. 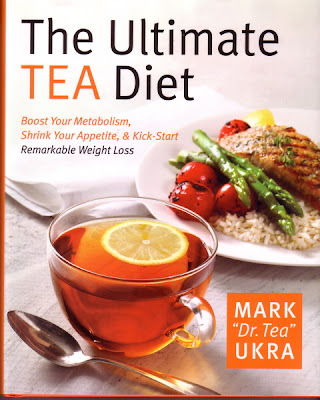 But there's a new "diet book" out that I submit to you is more of a "health guide" than a "diet book," and it's called "The Ultimate Tea Diet: Boost Your Metabolism, Shrink Your Appetite, & Kick Start Remarkable Weight Loss" by Mark "Dr. 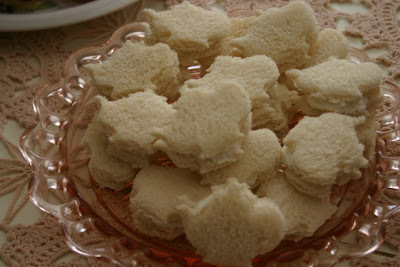 Tea" Ukra. Ukra is not really a doctor but owns an L.A. tea shop, and he has for years had customers ask for help in losing weight. He doesn't promote tea as a magic pill for those who want to keep overeating, but he does note that in combination with a balanced diet and moderate exercise, tea can be an enjoyable, healthful part of a weight loss plan. I should point out that Ukra does seem to mention his own brand of teas a good bit, so I was really wanting some of his Candy Bar Tea, but alas, I'm not prepared to shell out $12.50 for two ounces of tea PLUS $6.50 for shipping. But I *am* prepared to try some of the many recipes in this book. 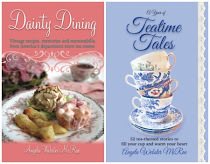 It was a pleasant surprise to see so many new recipes containing tea as an ingredient, such as Tea Apple Sauce, Broccoli Tea Soup, Tea Boiled Shrimp , Currant Tea Couscous and much more. There's also a nice section on tea history, making this a book that many tea enthusiasts - not just the dieting ones - will enjoy. With a little extra Christmas money to spend, I headed over to one of my favorite antique spots and was looking around yesterday. There were some good buys on teacups and saucers, but nothing I just "had" to have. There was a pretty rose print, but it was a little high-priced and I couldn't think of where I'd put it anyway. I saw a vintage tea tin that was kind of cute, for just $1, but it just didn't grab me. And so I was about to head out when I saw, in the very last booth I looked at, a Mrs. Tea. 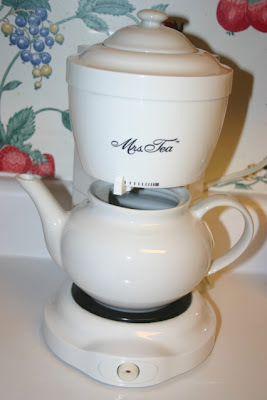 Some of you probably have this tea maker, but I wasn't yet a tea fanatic when it debuted (around 1995, I believe). I remember seeing it advertised in Victoria magazine years ago, but it wasn't a must-have item at the time. 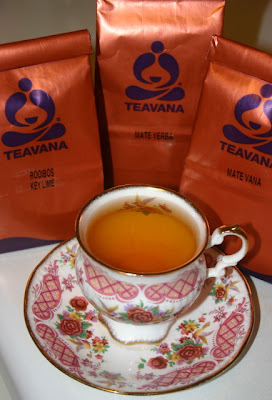 The week before Christmas, I had an interesting tea shopping experience at a Teavana store in Atlanta. A not very orderly line had formed, workers behind the counter were madly packaging teas for shipment, and the lone young man working the counter was juggling customers left and right. Alas, this was the evening I'd chosen to gather a variety of bags of tea as treats for my co-workers, so I settled in for a wait. I got one of the store's catalogs and began circling the teas I wanted, some nine in all, so I'd at least have my order ready when it was my turn. Imagine my surprise when the guy asked for the entire list of teas I wanted, merely nodded at each name, then proceeded to pull them all down from their tins, package and label them, and got it all entirely right. This was rather a fascinating thing to watch. 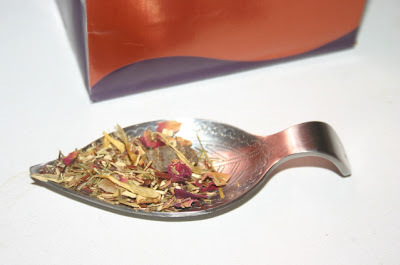 In addition to some plain mate for my husband to use in his mate gourd (he said the mate vana wasn't manly enough), and the teas for my friends, I got some Key Lime Rooibos, which is as pretty in the spoon as it is flavorful in the cup. Oh! And one other curious thing about Teavana: A woman came in wanting a cup of tea, but the guy told her they weren't serving tea until after Christmas because of how busy they were with sales. Question: If you're too busy to serve tea at your tea shop, are you perhaps TOO busy? At any rate, I am enjoying my tea and have always had a good experience with this tea vendor. I spend much of January thinking about resolutions and dreams and goals for the year. 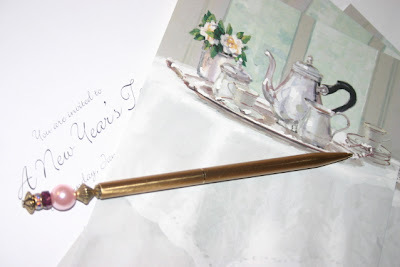 One of my "tea resolutions" is simple: have a tea or go to a tearoom every month of 2008! For inspiration, I found the perfect book, which I read over the past two evenings. 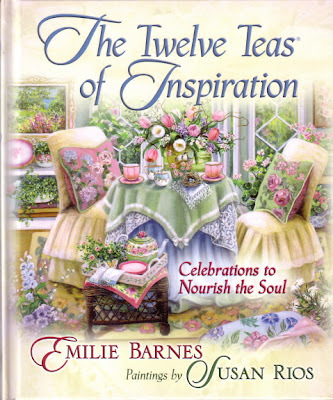 "The Twelve Teas of Inspiration" is the latest tea book from one of my favorite tea authorities, Emilie Barnes, and it has great tea ideas as well as lovely artwork by Susan Rios. 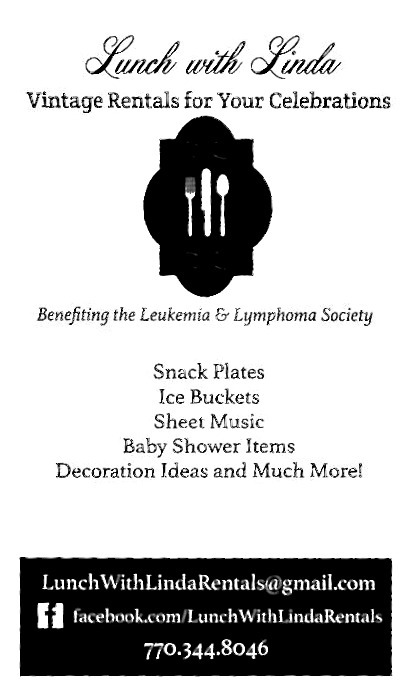 I love the idea of having a Memorial Tea, an upbeat tea designed in memory of a loved one, and the Thankful Heart Tea, which is all about gratitude for the people who have been a blessing to us in life. In addition to ideas for new tea themes, there are also some terrific new recipes I'm eager to try. I am blessed to have lots of tea-loving girlfriends in my life, so I don't think I'll have a problem coming up with a year of teas. I figure if I start planning now, even the girlfriends who live out of town will be able to come for tea sometime in 2008. Yesterday I put the first tea party invitations of the year in the mail, and since the three women I sent them to all live nearby, they should receive them today. Will they be able to attend the New Year's Tea I have in mind? Time will tell! While I was out Christmas shopping some weeks ago, I came across some interesting new tea cookies, and they are "tea cookies" in the most literal sense, since whole tea leaves are in the cookies. 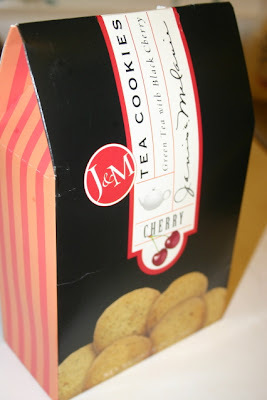 J&M, or Janis and Melanie, makes these Green Tea with Black Cherry tea cookies, bite-size treats in a nice package, kept fresh by the foil bag inside. The flavor is - how do I say this? - "different." They're not horrible, but they're certainly not the best I've ever had either. I was expecting more cherry and less green tea, and the green tea flavor definitely dominates. Perhaps they simply paled in comparison to all the rich, delicious cakes and pies I had over Christmas? I found this package at Filene's in Atlanta. It was $4.99 (said to retail for $7.50), and I'd love to know if anyone else has tried these cookies. If so, what did you think? Do you like the idea of eating tea leaves in your cookies? What an elegant teapot they have on the cover of the new Tea Time magazine! This pattern is "Louveciennes" from Haviland, and I googled and found it's a bit pricey, between $250-$350 depending on whether it's on sale or not. Haven't ever seen Haviland at T.J. Maxx, but we'll just have to keep our fingers crossed, won't we? My favorite article in this issue is "The Royal Butler," an interview with Paul Burrell, who was once butler to Princess Diana and before that, the Queen. One thing I found interesting is that the Queen's teatime is 5 p.m., when in this country we seem to believe a 3 or 4 p.m. teatime is the proper hour. (And really, I suppose "the proper hour" is whenever you like it to be.) 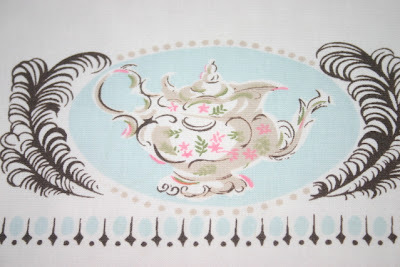 Burrell has also designed his own line of teawares, and I enjoyed seeing them on his website. 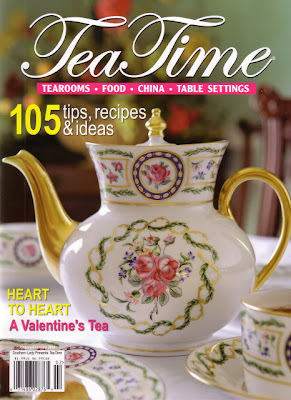 Also in this issue, there are numerous recipes for a Valentine's Tea, my favorite being one for heart-shaped Chocolate-Chip Cherry Scones. Does anyone else have this issue, and if so, what did you think of it? Our process of choosing a new president begins today, and I am more excited than a Georgia voter ought to be over the Iowa caucuses! Anyone from Iowa reading this blog? If so, please check in and let us know if you'll be voting tonight. 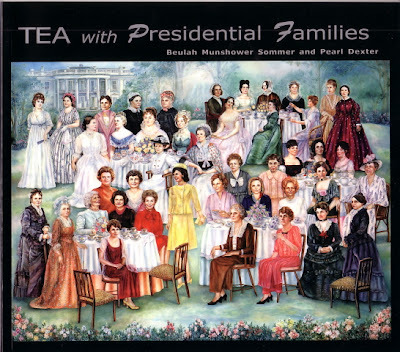 Since I can't vote, I'll be watching cable news shows and reading, finally, a book I bought last summer, "Tea with Presidential Families" by Beulah Munshower Sommer and Pearl Dexter. 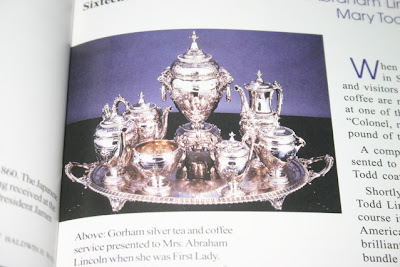 The many wonderful photos in the book depict items including a teacup that belonged to George Washington, middle photo, and the Gorham silver service given to Mary Todd Lincoln, above. To order a copy of the book for yourself, visit teamag.com. So, to ease the transition back to office life, I decided to start revamping the office tea corner. 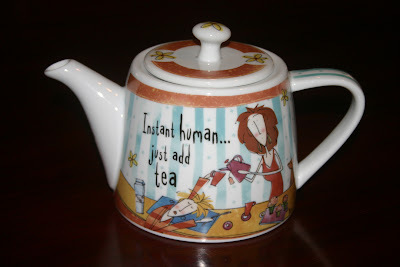 Toward that end, I found the perfect new teapot at T.J. Maxx (besides, I had a gift certificate to use). 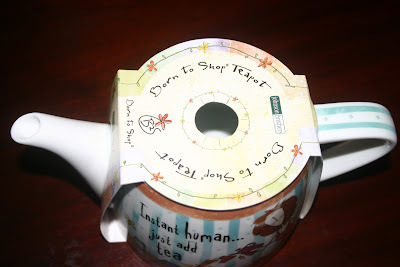 The packaging calls it the "Born to Shop Teapot," and you won't believe the maker. Guess.